All that glitters is not gold! In this case, it is glitter paint for fabric. Today being Day 14 of Suzanne’s Cheongsam Challenge, I thought it would be fun to share with you my DIY touch. I outlined all the flowers and leaves on the front of my batik sarong cheongsam, to add some glitz to the heaviness of the black background. With the slightest movement, the glitter outlines seem to dance in the light – if only fleetingly. The lines are so lightly drawn and yet gives the cheongsam a life of its own. Of course one can buy batik sarong fabric that comes with commercially done glitter outlines around the patterns, but it is so much more fun to create the same effect by oneself! If you will notice, this cheongsam has the matt gold trim a few inches higher at the hemline, just to bring some point of interest to the otherwise plain black hem. And the same trim at the front shoulder openings are slightly angular – again, just for visual interest. The accessories add to the colour contrast of the whole ensemble while the gold-faced sandals complete the outfit perfectly. Yes, even at 93, I try to present a well-complemented dress sense at all times. Have a wonderfully creative day. It is an overcast day and pastel colours come out to play, on Day 13 of Suzanne’s Cheongsam Challenge. For a change, the patterns and colours of this batik sarong fabric are subtle yet eye-catching in a tranquil sort of way. Very gentle on the eye and makes me feel like a flower! Even at 93! I chose to show both sides of the batik – that is, the ‘head panel’ and the ‘body panel’ on the front of the cheongsam. The opening on both sides of the front shoulders enables the top section to be of the contrasting section of the fabric. To emphasize the pinkish-red hibiscus flowers, the edges of the outfit are trimmed in matt red. The same is used for the simple Chinese style buttons. I happen to love hibiscus, which is Malaysia’s national flower. To complete the ensemble, I embellished it with red rose accessories (I told you I am young at heart..) and paired it with dark red beaded sandals – all of which I beaded myself. It is Day 11 of Suzanne’s Cheongsam Challenge and my choice of batik cheongsam plays on the deep and rich colours of exotic spices. The front of the cheongsam features the ‘head’ panel of the batik sarong, and it seems to be influenced by the characteristics of Moroccan or Turkish design elements. The Mistress of Spices: in case you have not read it or watched the movie, check it out. The trim highlights the opening on both shoulder sides, and is in deep, matt gold satin. Just the perfect complement to my sandals. To anchor the colours of the batik, I am wearing metallic black magnetite accessories. I have always believed in embellishing one’s outfit with accessories. Even at 93, not a day goes by without such finishing touches to my ensemble. Pretty in Pink! That is what Day 10 of Suzanne’s Cheongsam Challenge looks like today. Good day to everyone. This cheongsam is fashioned from a piece of fabric that is completely covered with 3D organdie rosettes. It is ultra feminine and oh so light and gentle to the touch. Not wanting to ‘trample’ on the rosettes, I did not have any front opening. Hence the silver grey satin trim is only for the collar and sleeve edges. And, the same trim is used for a simple, singular Chinese style button at the collar. The ensemble is completed with simple accessories and my self-beaded pink sandals! I thank the good Lord for the daily blessing of simple pleasures. Have a wonderful day! God bless. A very good Sunday morning to one and all. I wish to thank everyone who has been following Suzanne’s Cheongsam Challenge diligently, and I hope you will like my Day 9 ensemble today. Each new day your kind comments serve as an encouragement to continue sharing my cheongsam collection with you. Today feels like a ‘green day’ so I am wearing a brocade cheongsam in an eye-catching emerald green with circlets of gentle silver florets. The texture of the fabric lends itself well to emphasizing a well-cut and tailored outfit…don’t you agree? While colour experts say green represents growth and renewal..it also is the colour of jealousy! Hmm, I think ’emerald green’ still is the most apt way to describe the rich colour of this cheongsam fabric. As the overall fabric pattern is rather subtle, I opted for a diagonal right shoulder opening, highlighted with a purple satin trim around the collar, sleeves and hem edges. For the Chinese buttons in the same purple satin, I chose rather flowery-shaped ones. What a marvellous colour combination this is. Emerald green and purple. To echo the dainty silver florets, I accessorized with an all crystal set. And yes, I strung them up myself….even till now at 93, I still like creating ‘bling’, as the younger generation calls jewellery. Oh, and paired with pale silvery-gold filigree evening sandals, I think the ensemble is ‘complete’ for an elegant night out on the town? I wish everyone a day that is blessed with peace and joy! The colour red is festive, passionate, fiery on the one hand, while on the other, it is used to signal danger. Did anyone say it’s the colour of Santa too? Yes, indeed it is. 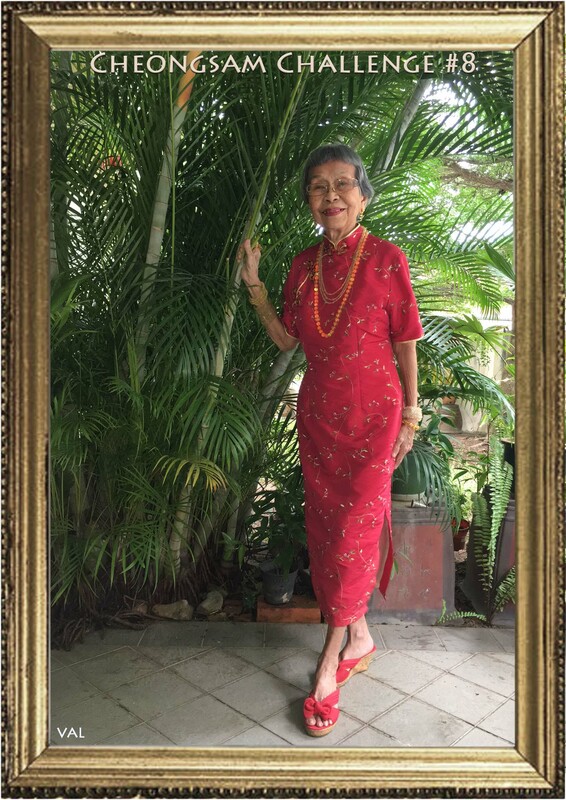 However, when a 93-year young lady dresses in a soothing shade of chilli red, punctuated with dainty embroidered flowers, it speaks volumes… which can be surmised in one word…. WOW! For contrast and to enhance the powerful red, I chose citrine accessories (which happen to complement the pale golden satin trim around the collar and side shoulder opening with Chinese buttons) plus my red bow sandals. Alright, now that I am all ready and dressed for Day 8 of Suzanne’s Cheongsam Challenge – shall we go paint the town RED? Have a lovely day and God bless us all.